Nottingham Forest ended a near 500-minute Championship goal drought as Lee Tomlin rescued a draw against Reading. 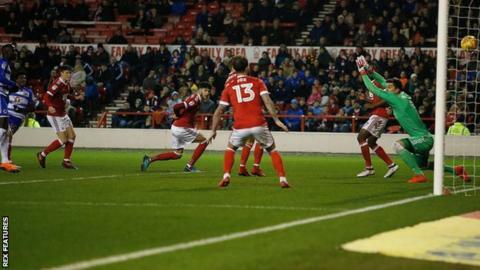 Tomlin latched on to Joe Lolley's square ball for Forest's late equaliser and their first league goal since 20 January, in a surprise win at Wolves. Full-back Omar Richards had fired Reading ahead in the first half after Costel Pantilimon could only parry a Chris Gunter shot across goal. The draw means both sides have won just once in their past 12 league games. Forest and Reading stay 17th and 18th respectively with the Royals four points above the relegation zone. Aitor Karanka's side are without a win in five Championship matches since they shocked leaders Wolves at Molineux. Reading's only win in their past dozen matches came at strugglers Burton. Richards' first senior goal looked to have been enough to secure a welcome win, but Jaap Stam's side were made to weather a second-half response from the hosts. Tendayi Darikwa was twice denied a leveller for Forest as he struck the crossbar before Richards blocked his rebound on the goal line. Cardiff City loanee Tomlin eventually found the back of the net as his low finish on the edge of the penalty box evaded Vito Mannone in the Reading goal. "We need to go to the pitch in the way we've gone in the second half because in the second half the atmosphere was amazing and we need to give the crowd that atmosphere. "We needed to be more aggressive because we were losing every single challenge in the first half. I'm really pleased with the response of the crowd. "We have a lot of good players and main thing is to create those chances, to play intense, to play aggressive and if we play that way we will have chances and we will win the games." "First half I thought was very good, we played some very good football and created some good opportunities to maybe score more than one. "Second half, we wanted to continue that and play a bit more aggressive against their press, which made it difficult at times. "We were confident today what we could've done, unfortunately we couldn't find the second goal but at times we should've done better. "Playing here isn't always the easiest. A point is at least something out of it, but of course we would've rather had three." Match ends, Nottingham Forest 1, Reading 1. Second Half ends, Nottingham Forest 1, Reading 1. Attempt saved. Matthew Cash (Nottingham Forest) right footed shot from the right side of the box is saved in the bottom right corner. Assisted by Daniel Fox. Attempt blocked. Adlène Guédioura (Nottingham Forest) right footed shot from the right side of the box is blocked. Substitution, Reading. David Edwards replaces Liam Kelly. Substitution, Nottingham Forest. Adlène Guédioura replaces Lee Tomlin. Goal! Nottingham Forest 1, Reading 1. Lee Tomlin (Nottingham Forest) right footed shot from the centre of the box to the bottom left corner. Assisted by Joe Lolley. Attempt missed. Ben Brereton (Nottingham Forest) right footed shot from the centre of the box misses to the left. Assisted by Ben Osborn with a cross. Corner, Reading. Conceded by Joe Lolley. Offside, Nottingham Forest. Lee Tomlin tries a through ball, but Ben Brereton is caught offside. Substitution, Reading. George Evans replaces Joey van den Berg because of an injury. Attempt missed. Matthew Cash (Nottingham Forest) left footed shot from the right side of the box is high and wide to the left. Assisted by Lee Tomlin. Chris Gunter (Reading) is shown the yellow card for hand ball. Sone Aluko (Reading) wins a free kick in the defensive half. Foul by Chris Martin (Reading). Chris Martin (Reading) wins a free kick in the defensive half. Omar Richards (Reading) is shown the yellow card for a bad foul. Attempt blocked. Chris Martin (Reading) right footed shot from the left side of the box is blocked. Assisted by Liam Kelly. Lee Tomlin (Nottingham Forest) is shown the yellow card. Hand ball by Lee Tomlin (Nottingham Forest). Lee Tomlin (Nottingham Forest) wins a free kick in the defensive half. Attempt missed. Ben Osborn (Nottingham Forest) left footed shot from the left side of the box misses to the left. Assisted by Joe Lolley. Attempt saved. Leandro Bacuna (Reading) right footed shot from the right side of the box is saved in the bottom right corner. Assisted by Chris Gunter. Substitution, Nottingham Forest. Matthew Cash replaces Kieran Dowell.